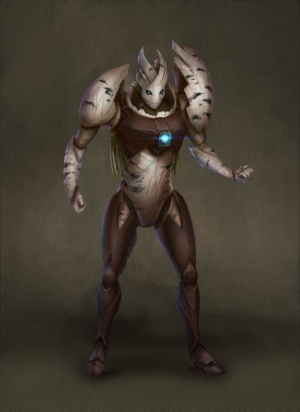 The Decheerans are an extremely long-lived race of genderless, tree-like bipeds native to the planet Atria. They are a member race of the Song Dominion. Physically resembling trees, Decheerans have a somewhat humanoid appearance. They do have an analog to smell, and have a very keen sense of it. They can smell layer upon layer of scents simultaneously, combining into a kind of aroma symphony. In particular, they love the deeply subtle scents of forests and swamps. Decheerans reproduce asexually, via a process called "budding." 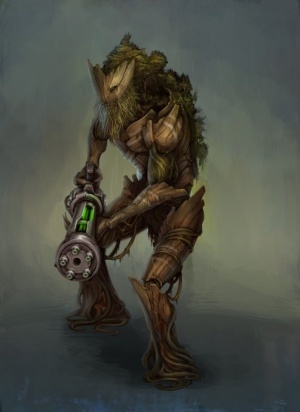 A Decheeran who is willing spends some time meditating in a forest or other suitable location, and sheds an arm or a leg when it wants to spawn a new Decheeran. The proto-Decheeran roots itself to the ground, and that's the last intentional contact a Decheeran has with its "children." They don't recognize or care later who spawned them, or whom they spawned. The proto-Decheeran then spends ~30 years growing, slowly, gaining in sentience until one day, it decides to unroot and move, at which point it is considered an adult Decheeran. The Decheerans first achieved spaceflight around 105,000 B.E., making them among the older Younger Races. They don't have families or any concept of one. What they do have are groups of Decheerans called Groves. These are completely voluntary associations of Decheerans who bond with each other by rooting in a group together for a period of time, after which they are closely allied and can very vaguely feel the emotional state of other Grove members. It is possible to voluntarily cut off your connection with a Grove, but it's not possible to eject an individual unwillingly from a Grove. They have an interesting view on technology generally. They certainly use it and are actually quite adept with it. They live in their native forests with technology, but it's usually blended with or accompanied by significant organic material. That might be anything from having living trees on their starships to deep bonds between nanotech and organic tech in their planet-bound dwellings. They don't have a government as such, though they do have those who speak for the will of the majority of Decheerans, called Speakers. There's also a First Speaker, who will speak for them in the most important cases, but these are not leaders as such. They don't have a formal religion, but they do speak reverentially of the force they believe allows them to form Groves - called the Tal. It's not a god as such, and it dictates nothing for them behavior-wise. They don't personify it either, choosing to simply revere the idea of it. This page was last modified on 7 July 2018, at 21:54.